Overset surface grids for the ONR Tumblehome ship. Solution by CFDShip-IOWA. Celeritas Simulation Technology announces the commercial availability of Suggar++, a general purpose overset grid assembly code. Suggar++ can be used as a pre-processor for static configurations or coupled with the overset flow solver for time dependent simulations. The software supports both structured and unstructured overset grids. Other predictions include personalized medicine, severe weather prediction, and proofs of black hole evaporation. 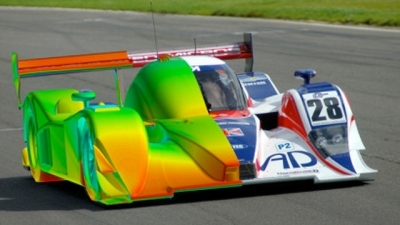 CFD results superimposed on a photo of a Lola B08/80 LMP2 car. Speed TV goes inside motorsport company Lola and learns about their use of CFD. SolidWorks Flow Simulation was used to compute the flowfield around Mary Poppins and her umbrella. An Ohio State professor simulated the flow in an unducted counter-rotating fan. Beta CAE released ANSA v13.2.1. NASA Dryden’s F-15B test aircraft was used to collect data on a new inlet concept, the Channeled Centerbody Inlet Experiment, that will be used to validate CFD simulations. ANSYS CFD was applied to the Toyota Prius. 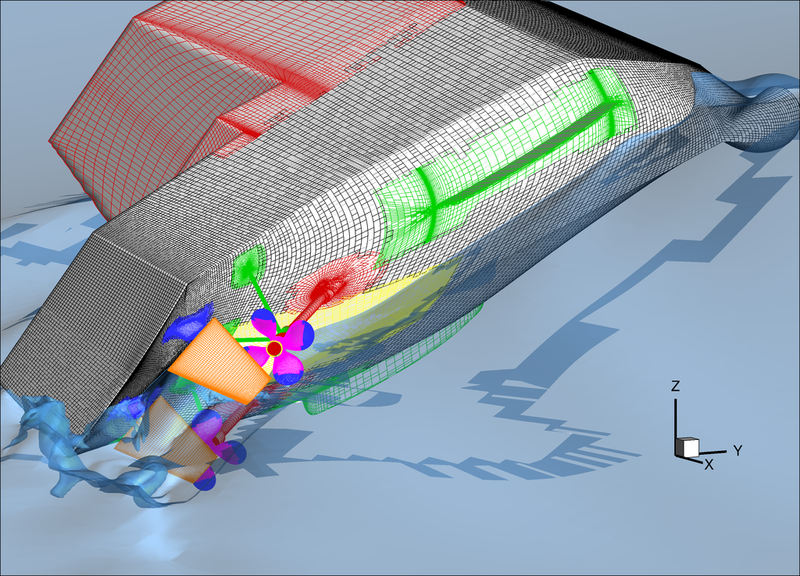 Sweden’s KTH is seeking an Application Expert/Researcher/Postdoc in CFD. AVID LLC‘s CFD expertise is available for consulting services. This gallery of turbulent flows is from Stanford’s Center for Turbulence Research. Donkervoort Automotive redesigned their D8 GTO with the help of SolidWorks Flow Simulation. Clockwise and counterclockwise vortices around a dragonfly wing (black). A Cornell University professor has used a two-dimensional simulation of the unsteady Navier-Stokes equations to show that insects like bumblebees and dragonflies are able to fly through the interactions with vortices produced by their flapping wings. This NSF-funded study was performed in 2D. Work on 3D simulations is underway. Pointwise is seeking engineers for several positions. Please share this with your job-seeking friends and colleagues. This entry was posted in Applications, News and tagged Celeritas, Pointwise, sgi, SolidWorks, Suggar++. Bookmark the permalink.